Were excited to be back after a long absence but for those of you following us rest assured that The Untold Legacy has never ceased development. In fact we have been so busy working on the game its been difficult for us to find time to post regular development articles. Moving forward we fully intend to post a new article every Friday. If that goes well I will be sure to post more. We have exciting news coming mid January so keep an eye out as we continue to make regular posts. During our time away we made long strides in terms of environmental assets as you can see above. 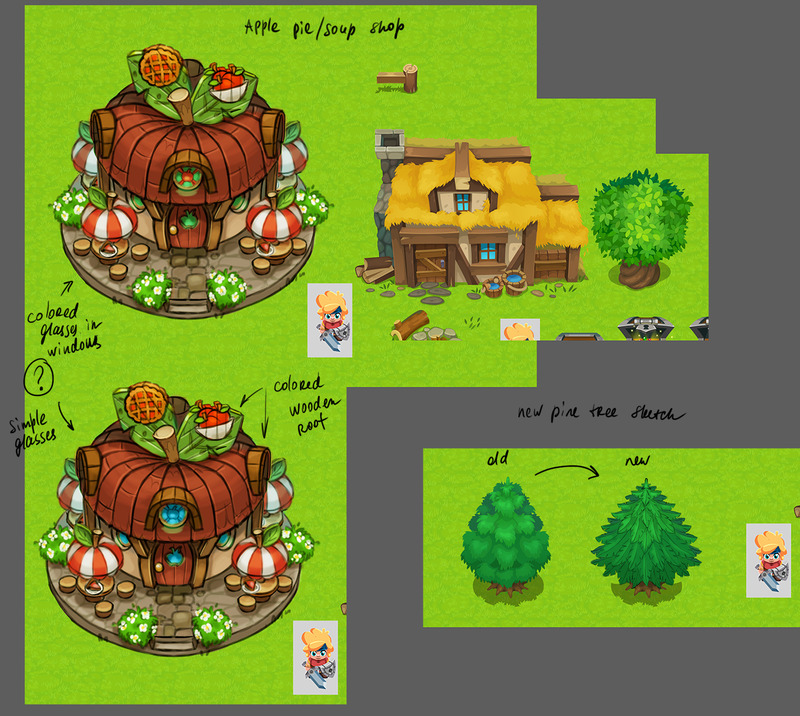 We started with some early concepts and eventually polished it all out and found the style we wanted. However it was not an easy road. We spent around 8 months trying to find the perfect style while working on various parts of the game. Not all the iterations are shown but below I have placed a series of images for everyone to see our progress. Shortly after we dropped off the face of the planet we began doing early environment art concepts. Although some were promising we ended up landing what is pictured at the top of this page. You can see one early test image below. 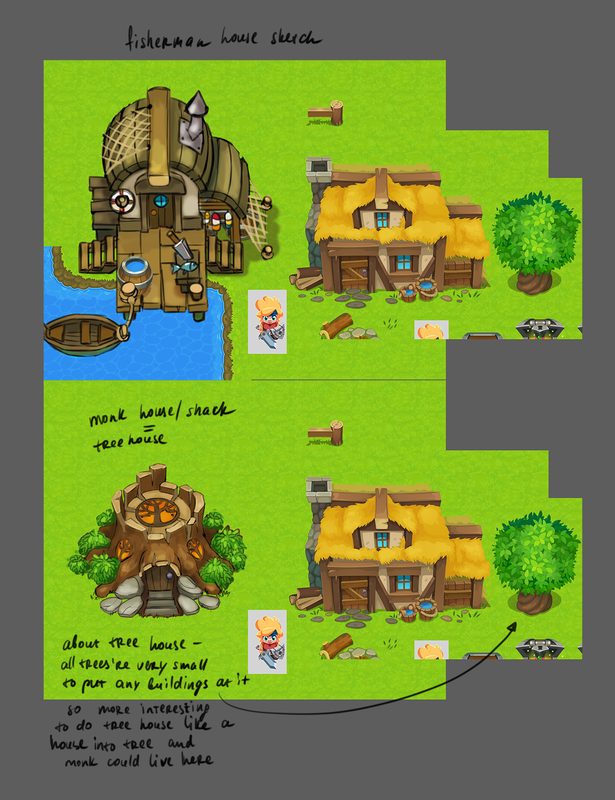 The idea we started with was in direct relation to our notes in regards to the games completed story. The games first area, known as Crescent Peak, and starting point is in a quiet farming/mountain village that is shut off from the world. This is not by choice but due to the fact that the simply cannot leave because the world outside is cursed. And if you are to enter that world you will also fall to that curse. Despite this dark omen the villagers are rather cheery and friendly and act as one big happy family. Although this seems pretty good we felt it wasn't really in line with the clean/simple and "cartoony" artistic style of the characters. 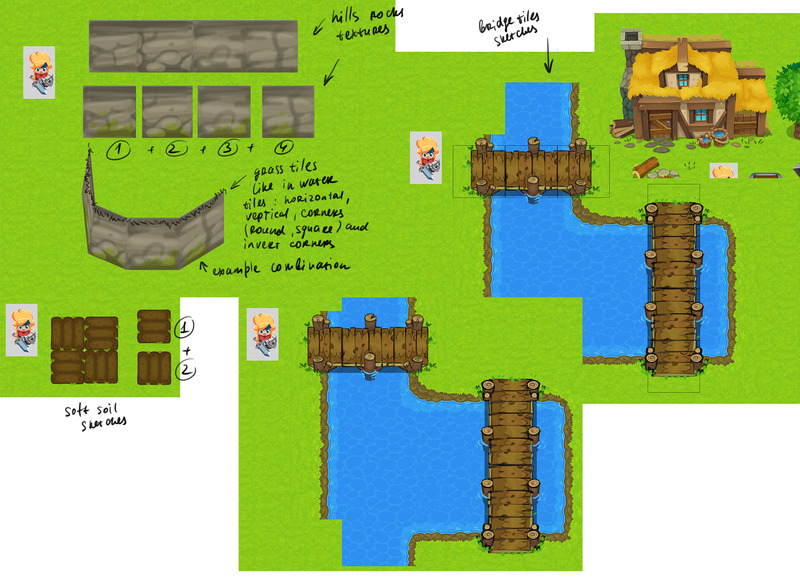 We set out to create another iteration of the environment art. This time it was close to what we wanted but ended up being just a bit to simple for the world we wanted to create. So we went back to the drawing board and ended up with this as our first approved environmental art concept image. The entire team was exceedingly happy at this point and everyone involved felt invigorated after the several failed attempts prior. Although it wasn't yet perfect we new we had discovered what we wanted. We continued on making several iterations of each individual art piece. With the style chosen it was a pretty smooth process with small iterations at each turn. One completed house with a new house design as will as an early brick pathway. Here we have an early image of the games hills. 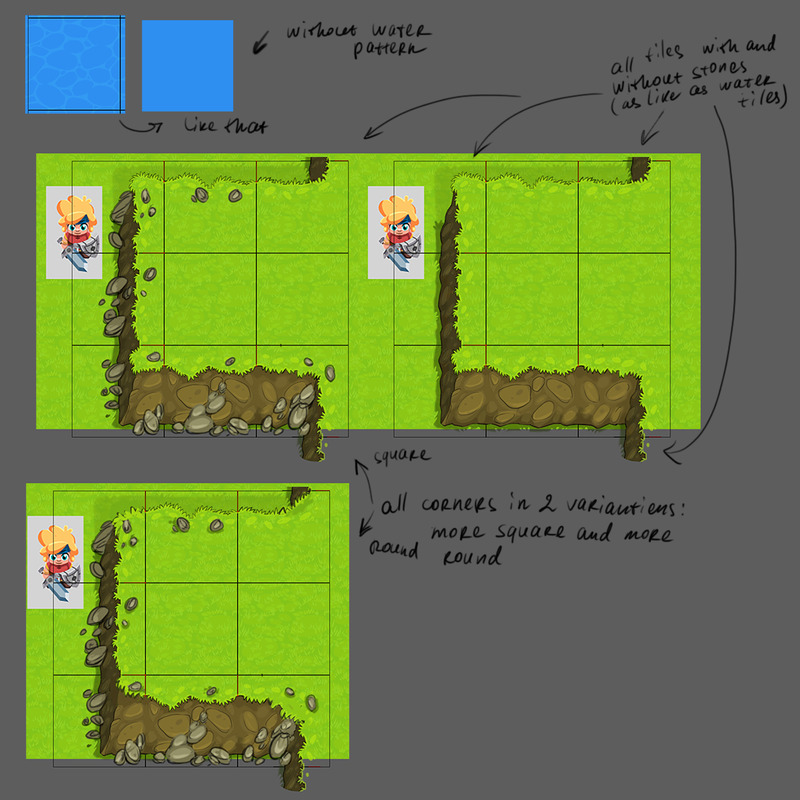 This is before we had decided to completely ditch 2D tiles in favor of 3D environments. (textures mapped to 3D objects) We wanted the hills to cast shadows and have realistic physics to them and it made the most sense in the end to ditch the design. 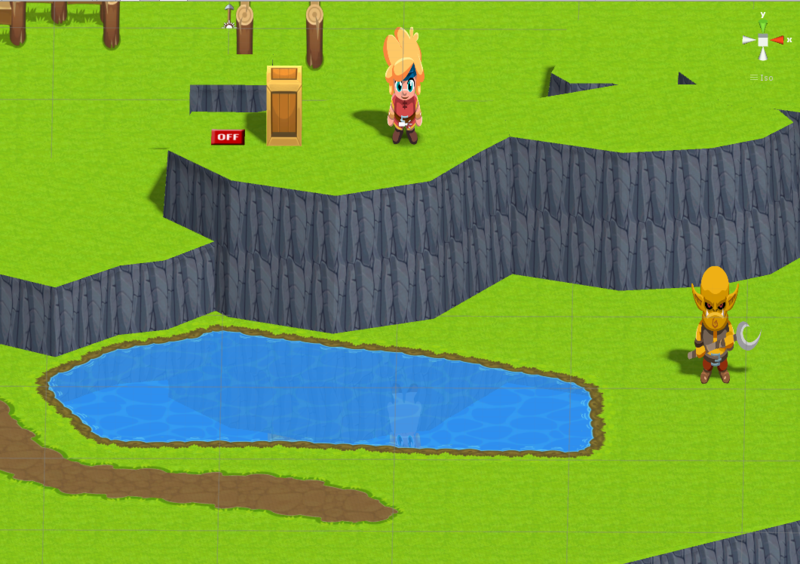 Here we have an early mock up of how hills could look as well as some water and how bridges will be fir together. We decided to go in this direction and are super happy with how the final design turned out. 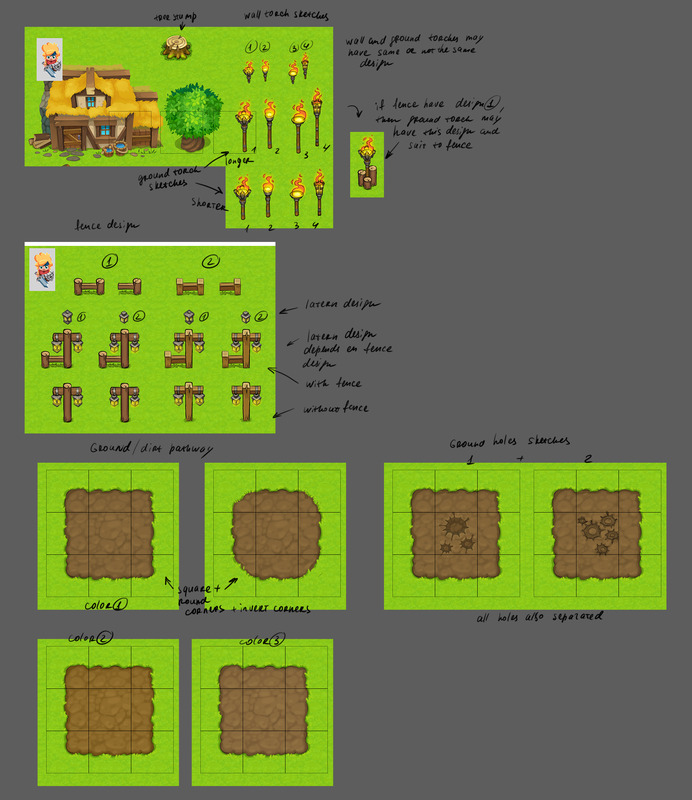 Here we have several iterations of torches, fences, lanterns, dirt pathways and holes in the ground.Our goal from the start was to try and include as much detail as possible so we could create a full, moving and vibrant world for the players to explore. The games first area, Crescent Peak, is meant to be a secluded mountain village of farmers. There the whole village works together and grow their own food. 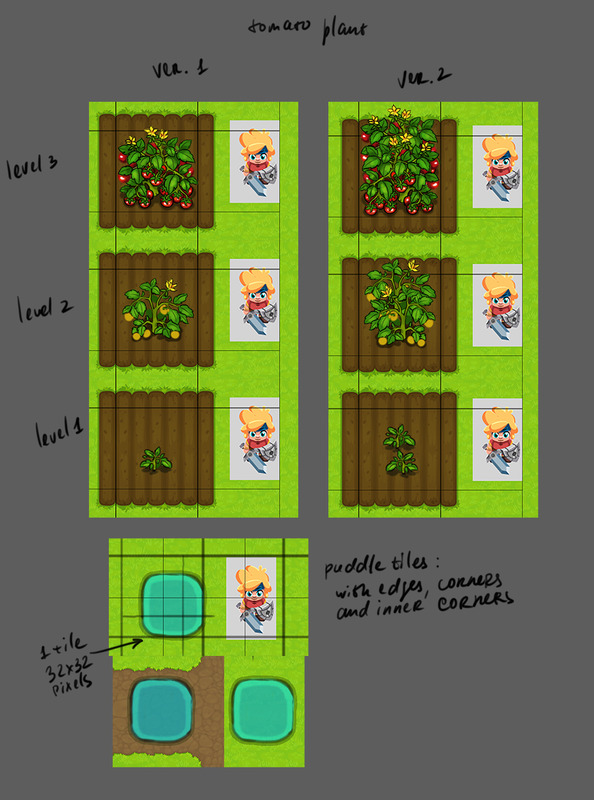 Below you can see our initial concepts of the kind of fruit and vegetables that are grown in the village. All the fruit/vegetables grow realistically and have several phases of growth. 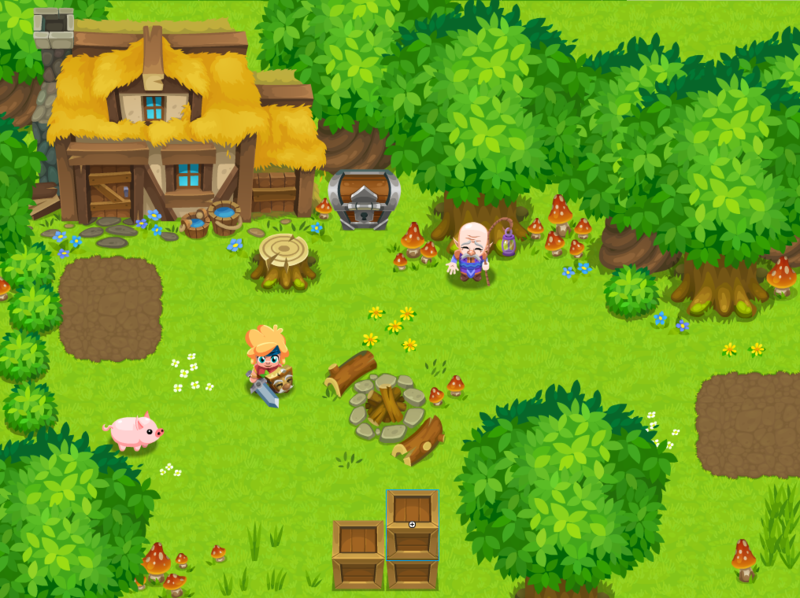 This is probably most comparable to something like harvest moon. You can also make out a small puddle of water at the bottom. 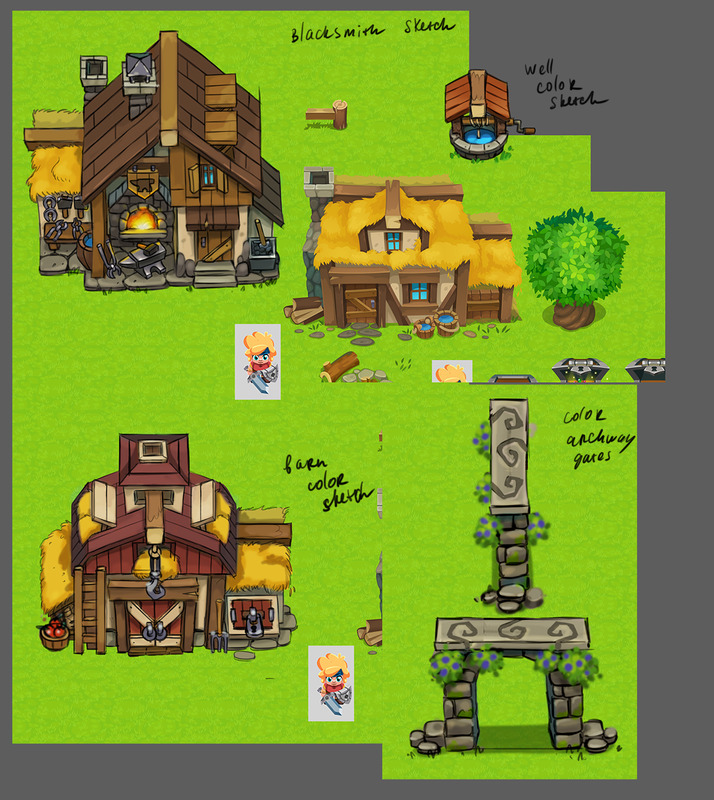 Below you can see some of the various artistic concepts we had for buildings. Many of which are rather detailed and each have their own story as you look at them. Here you see the potion shop concept. Imagine how those cauldrons will bubble up with various liquids. 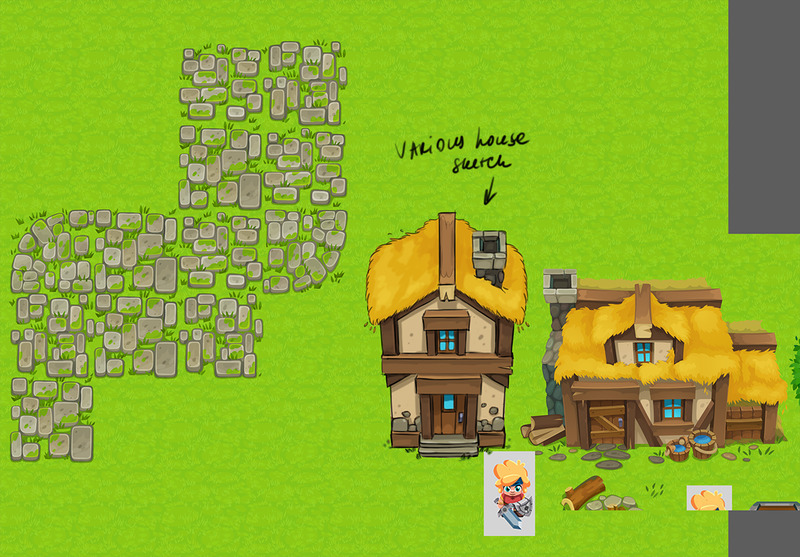 Here we have the fisherman's hut and the village monks house. 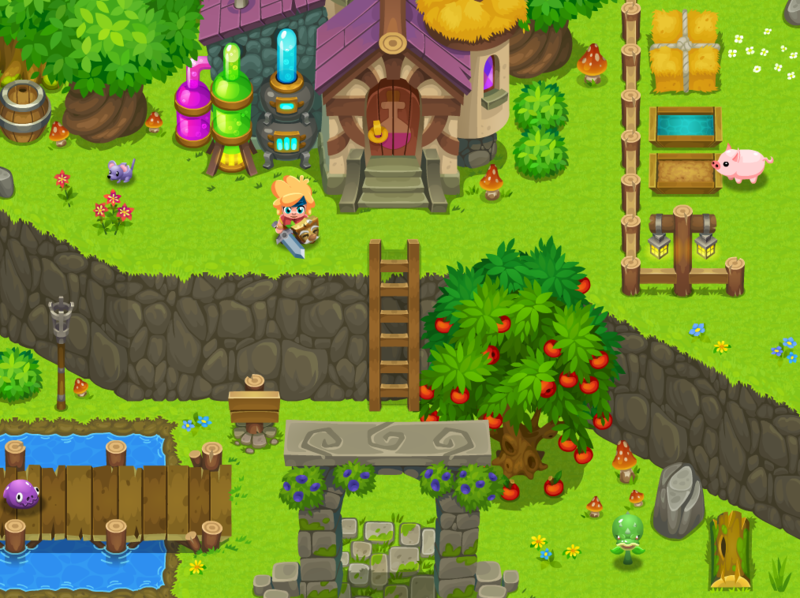 Here you can see our apple soup and apple pie shop. This is a single shops that is shared by twin sisters who constantly feud about who's product is better. You can also see an older version of a pine tree next to a new version in the bottom right hand corner. This is just a small test area without dynamic shadows and 3D lighting enabled. Some small bits of polish you can look forward to are how everything will cast a real time dynamic shadows, 3D lightning, "mostly" easy depth sorting/management, particle effects, weather effects and a realistic world (think about how trees will move with the wind) . What does this mean? Basically the shadows are created just like a real shadow would be. There is a light source and any object is able to cast a shadow. You can see an example of this below. 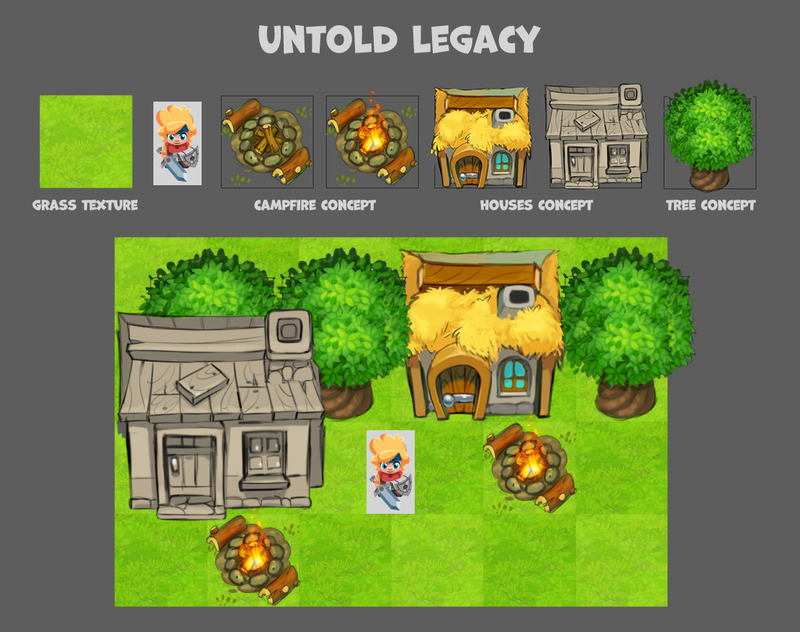 This is easily done because The Untold Legacy is actually created within a 3D environment. 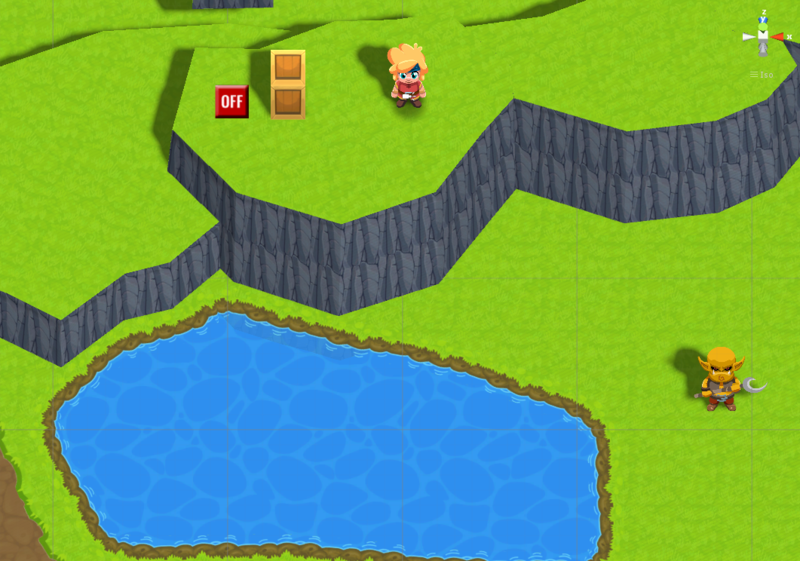 We just utilized a few tricks to actually make the game appear 2D while actually working within a 3D landscape. This allows us to use more realistic lighting, realistic 3D physics for movement and also allows us the use of 3D models wherever we may desire. You cans see this illustrated below. Below is a test/debug area as shown with the camera positioned from a 2D perspective. Keep in mind what is shown is in the editor so it may appear a bit blurry and place holder art is present. And again this is the same area shown but with the perspective tilted to show the game in its true 3D form. One thing you can notice in the image above is that the water actually casts a reflection. This adds a tremendous amount of polish in my opinion and some nice production value. What you cant see is that the water also moves rather beautifully and sways. It is also effected if the player dives into or touches the water. Another thing we have implemented is 3D textured objects. A good example is the box/crate. Above you can see us testing it in one of its earliest incarnations. Our reasons behind doing this are because we wanted the box to realistically flip and rotate when pushed off of high platforms. This wouldn't have been possible if we had gone with a 2D static image. 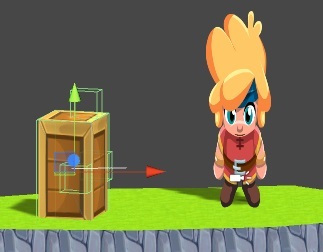 If we had gone with traditional 2D the box would simply have fallen without any movement or I would have had to animate the sprite. Both a bit stale when this solution seemed much simpler. Here you see the Box shown in from a 3D perspective. Among what you see there has been even more work done behind the scenes that is not at first noticeably. The games editor is being continually added to so we can easily add objects, quests, items, animations with the utmost ease. One of which is how the waters edges can be bent and manipulated using meshes so we can create lakes into any desired shape. Take a look at it in action below. As you can tell were striving for a high level of polish. This will continue into the environments inter-activeness. Not only will water reflect light and move realistically but you will also be able to fish in these waters. Below you can see some strands of grass which are being effected by wind. 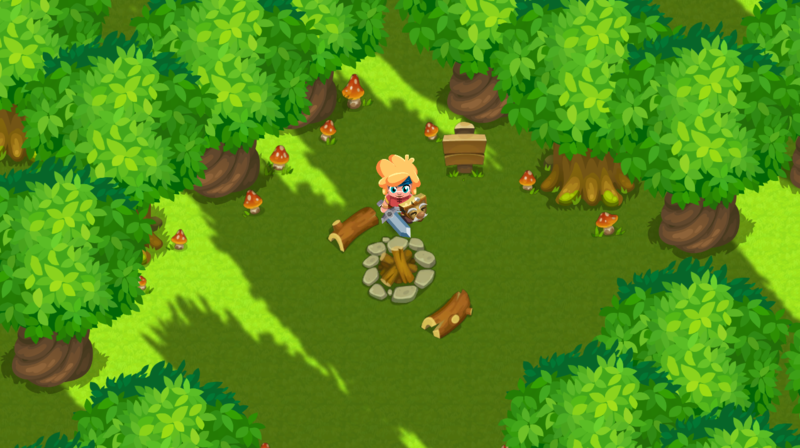 You can also see how the player is able to slash them away. 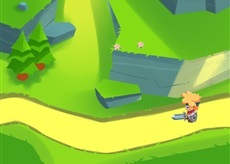 The grass will also move realistically when walking through it. I originally planned to post more but I now realize that is unnecessary. This article is already rather lengthy and I will post the additional information next week. You can look forward to seeing some updated animations, enemy art as well as some early gameplay sneak peaks. If your interested in following our progress a little more closely please check out our twitter and Facebook below. We would appreciate a follow and a like! Your art is gorgeous and I'm very excited to see the game in action in some sort of demo! Thank you so much! Its great to have some positive feedback and it adds further motivation for me personally. We should have a demo soon but I plan to continue posting development news in the mean time. Yeah, the artwork is awesome and you guys seem to have ambition and needed skills to make it happen. Thank you so much! So motivating to see people are excited by what we are doing. Ill post another update soon but ive been polishing some of the older art and redoing some animations. 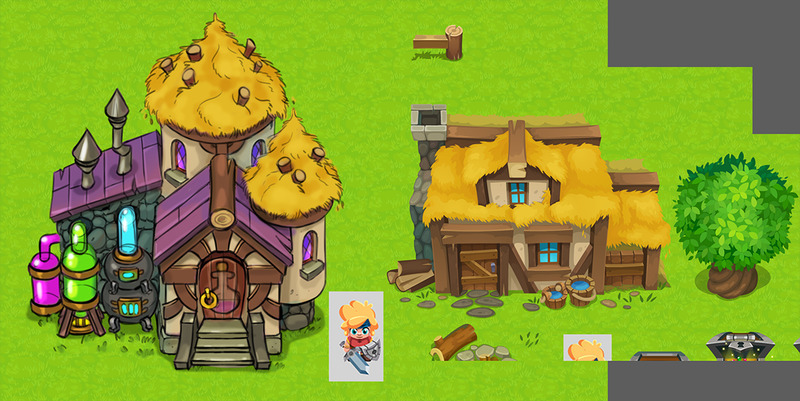 (as well as making new environment art) I have redone the hero art and its looking a lot nicer in my opinion. 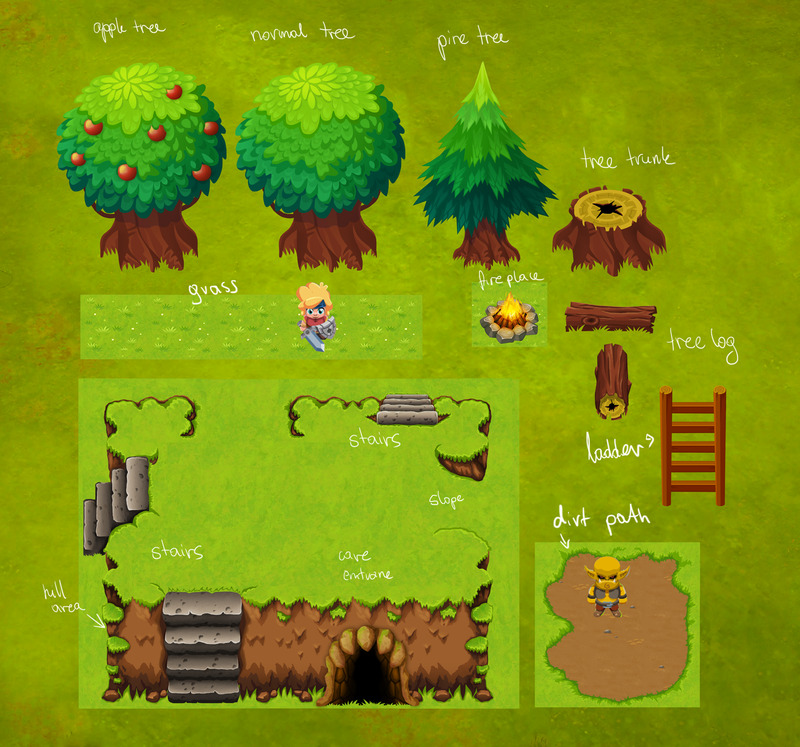 Ive attached an image with some early dungeon art. Let me know what you guys think.